Last week, Dr Kwasniewski sent me a link to Matthew Hazell’s latest piece on his blog Lectionary Study Aids. It is, as always, both useful and interesting: a brief summary of Fr Cipriano Vagaggini’s book The Canon of the Mass and Liturgical Reform, and a link to a scanned copy of the book, now long out of print. (Fr Vagaggini was a major contributor to the post-Conciliar reform of the Ordo Missae.) I was going to write about the post with links to Matthew’s blog, but it occurred to both Peter and myself that since we think our readers should know about all of his excellent projects, it was easier just to ask him to join the writing staff at NLM. I am very pleased to say that he has accepted our invitation. Matthew will continue to post his work and research on Liturgical Study Aids, but also give notices and links here on NLM about what he’s been doing. Welcome aboard, we’re delighted to have you with us! 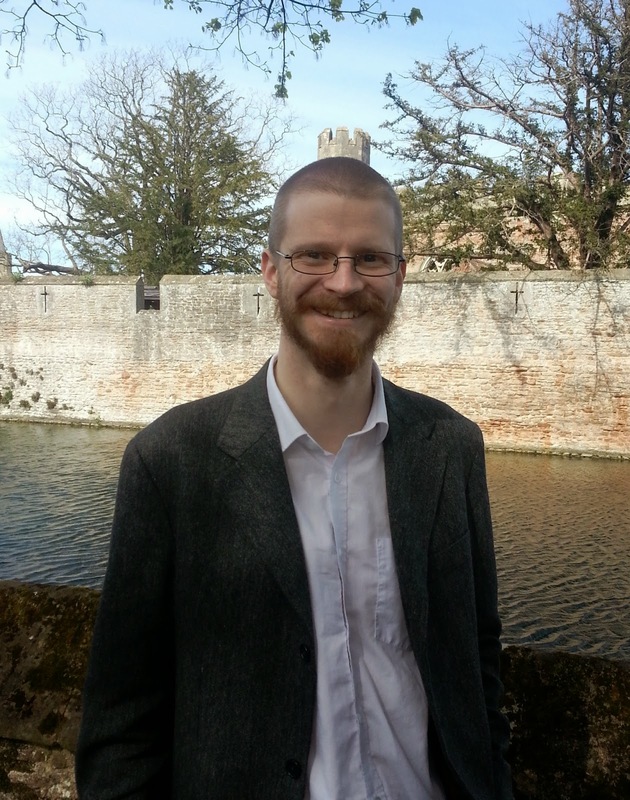 A biographical notes from the man himself: Hailing from the United Kingdom, Matthew is a convert to the Catholic faith from evangelical Protestantism, and was received into the Church in 2008. He has a B.A. (Hons.) in Biblical and Applied Theology from the University of Wales (Bangor) and an M.A. in Biblical Studies from the University of Sheffield. While studying for his M.A., he met his wife, Lucy, and the two of them currently still live in the glorious city of Sheffield. Since discovering and becoming attached to the usus antiquior, Matthew has developed a keen interest in the liturgical reforms carried out during and after the Second Vatican Council, as well as the history of the Council itself. Recently, his research has concentrated on the Postcommunion prayers of the usus recentior and their sources, but he has also done work on the post-Conciliar reform of the Roman Lectionary, and the various interim and experimental lectionaries used in various countries during the 1960s. He is also working on a study of the long and short forms of readings on Sundays and solemnities in the usus recentior, from the viewpoints of both biblical theology and liturgical theology, which he hopes to discuss on NLM. When not working or studying, Matthew likes to play board games and retro video games, preferably with a nice pint of real ale or a bottle of Trappist beer to hand! 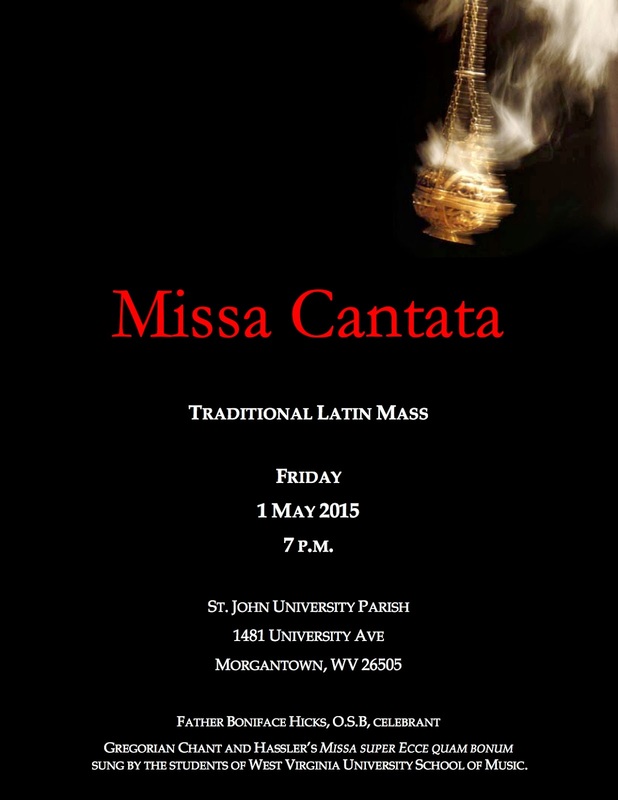 A Missa Cantata that will be celebrated this Friday on the Feast of St. Joseph the Worker in Morgantown, West Virginia, home of West Virginia University, at St. John University Parish, 1481 University Ave, at 7 p.m. The celebrant is Fr. Boniface Hicks, O.S.B. of the Monastery of St. Vincent Archabbey in Latrobe, Pennsylvania, known for his work with WAOB Catholic Radio in Latrobe. A choir of students from West Virginia University will sing H.L. 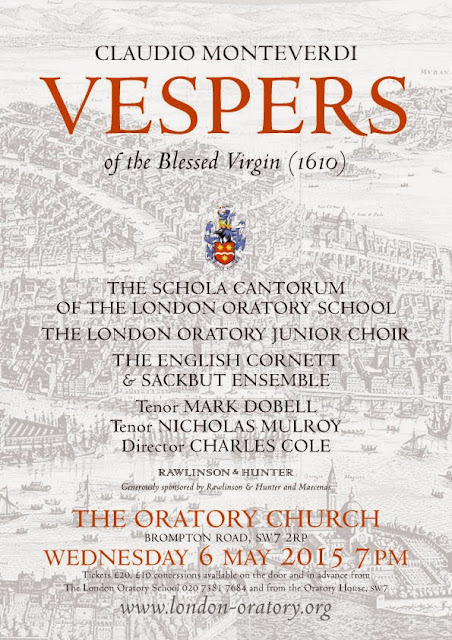 Hassler’s Missa super Ecce quam bonum and Gregorian chant. Full-time, single-day, and student-rate registrations available. Scholarships for seminarians still available. 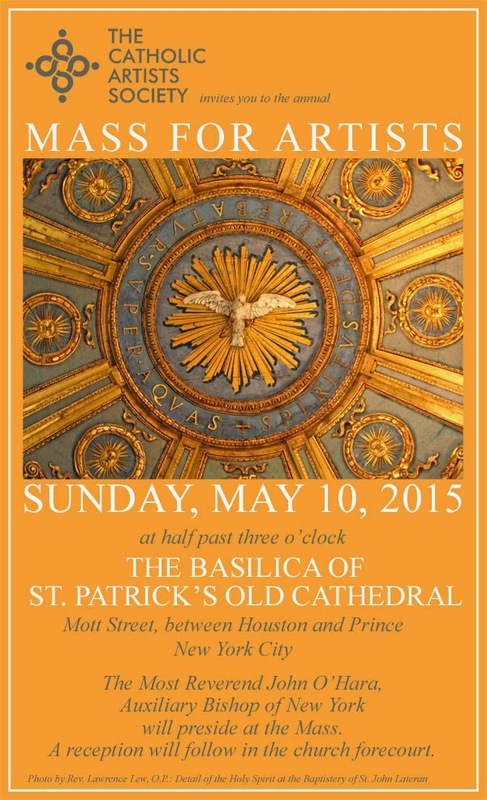 The Catholic Artists Society will host its annual Mass for Artists at 3.30pm, Sunday, May 10, 2015 at the Basilica of St. Patrick’s Old Cathedral in SoHo. Artists, patrons and friends of the arts are invited to attend. His Excellency Bishop John O’Hara will preside at Solemn Mass in the ordinary form. 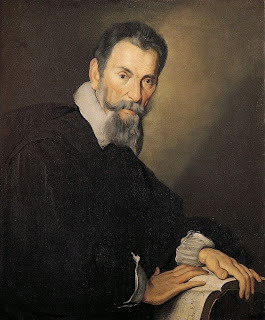 The Schola Cantorum of St. Agnes will sing the Missa Congratulamini mihi by Orlando di Lasso (1532-1594). There will be a reception following the Mass in the basilica’s courtyard. For more information, contact catholicartistssociety@gmail.com. 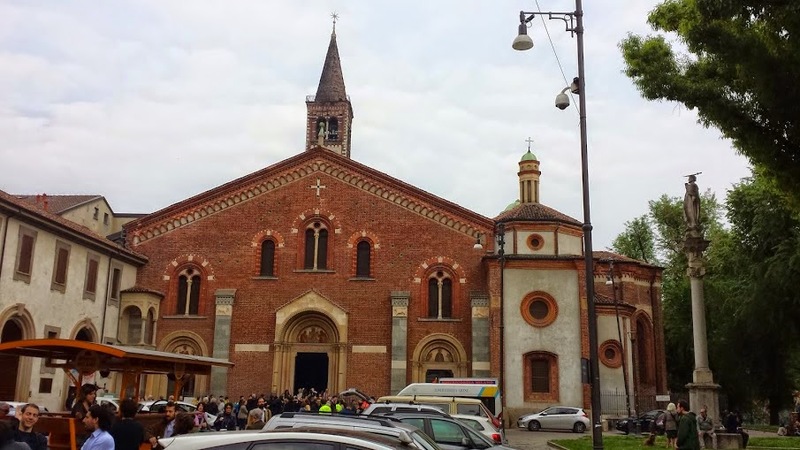 We are very grateful to Dr Donald Prudlo, Associate Professor of Ancient and Medieval History at Jacksonville State University in Jacksonville, Alabama, for sharing with us this account of the festivities held in Milan in honor of St Peter Martyr a few days ago. 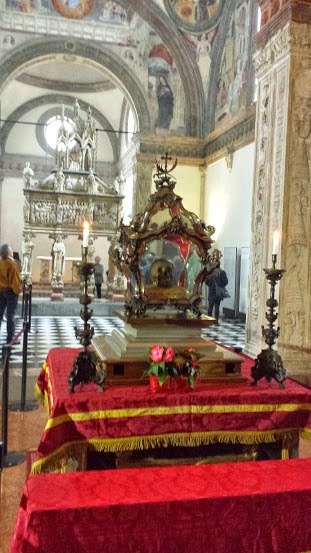 Today, April 29th, is the traditional day of the feast, but at the Basilica of Saint Eustorgius, where the Saint’s relics are kept, it is usually transferred to the nearest Sunday. Dr Prudlo is a specialist in the study of the cult of the Saints, and has often provided commentary for Vatican Radio during canonization ceremonies. Peter of Verona was an early Dominican inquisitor, brutally murdered in 1252 by Cathar heretics. He had been active in public ministry for nearly 30 years in northern and central Italy, and was one of the most powerful preachers of the age; after his martyrdom, he became the fastest canonized saint in history (less than 11 months after his death). His relics are kept in the Romanesque basilica of Sant’ Eustorgio in Milan, formerly also home to the relics of the Magi, which were later looted by Barbarossa and taken to Cologne. St Peter is co-patron of the quarter and the parish, and each year, on the Sunday closest to his feast, the local church celebrates in his honor. 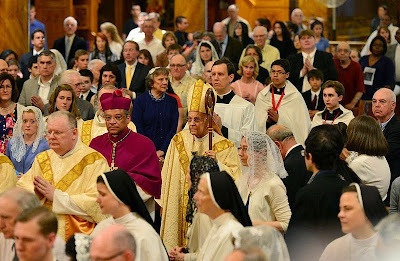 I was privileged this year to be present for the festivities, which demonstrated the close connection between liturgy and the Saints: an excellent example of liturgical and extra-liturgical devotion, and a witness to an ancient cult still alive and well in the Church. Saints, even those canonized with a universal cult like St. Peter Martyr, are testaments to the intersection of catholicity and particularity. 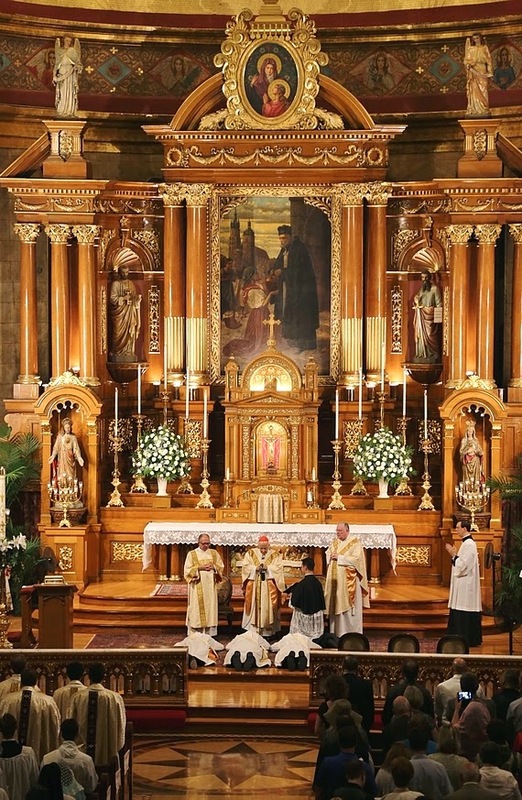 When one attends the feast of a Saint, one sees evidence of the organic growth of liturgy as it took place over the centuries, all the while embedded in the continuous traditions of the broader Church. Saints are the liturgical signposts of the year, marking in their lives the radical following of Christ, in the case of martyrs, even to death. They are the lived Anamneses of the Church. The celebration of their feasts is a present reminder of the unity of their sacrifice with that of Christ, made manifest in the celebration of the Sacrifice of the Mass over and near their tombs. Yet even while recalling the universal nature of the Church, each local saint is an incarnational presence in a particular place. Each patron saint comes with interesting local customs, that one can usually only see in a certain location, usually only once a year. Peter’s feast is no different. It is still celebrated near its date on the traditional Calendar, April 29, something which is quite common, at least in Italy. This further increases the special nature of the feast, for it is like according an extra celebration to the patronal saint, one for the locality, and one for the Universal Church. (Peter’s was removed from the universal calendar in the post-Concilar reform, but he retains a commemoration in the Dominican order on June 4, the date of one of his relic translations). The parish had two Masses on Sunday in Peter’s honor, each with its own particular characteristics. Both were in the revised Ambrosian rite which -- while much simplified -- retains certain carryovers from the old Ambrosian Rite that Peter would have been familiar with in his lifetime. (One particularly medieval moment was when a dog started barking in the back of church during the sermon, particularly apposite for Peter when one recalls the old nursery rhyme “Hark, hark the dogs do bark, the Beggars are coming to town.”) A common point between the two forms is the burning of a paper globe high above the Gospel side of the altar in a special wrought-iron carrier borne by two angels. On the globe was the word “Credo,” which to reminds us that Peter’s was a life lived for the Creed. His story begins with him defending the Creed against his angry heretical uncle as a seven-year-old, and ends as he begins to recite “Credo in unum Deum” when he was struck dead. Peter’s life was dedicated to a radical living out of the doctrine of the Church in all his endeavors: his preaching, his pursuit of heretics, and his warm relations with religious and laity. At Sant’ Eustorgio, the globe is set afire by a triple candle. This represents the fire of Charity which, when added to doctrine, sets afire the whole of the earth; the triple candle also stands for the faith in the Trinity, which is the principle of evangelization to light the world ablaze. 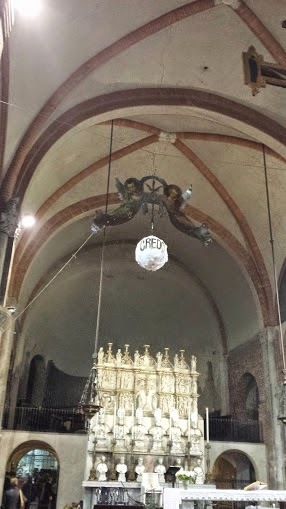 The paper globe which Dr Prudlo describes above, called a “faro” in Italian, is filled with oil soaked cotton, and set alight at the beginning of the liturgy, before the Mass proper begins. This is done only for feasts of Martyrs in their own churches in the Ambrosian Rite. 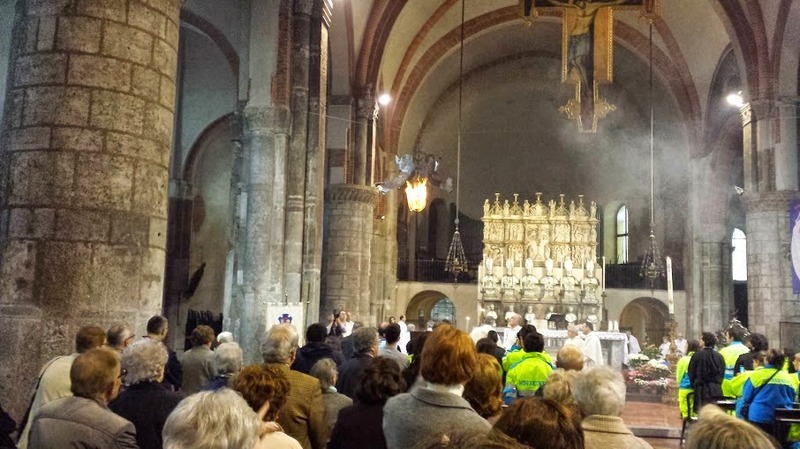 The first Mass concluded with a procession into the Portinari chapel, usually behind an annoyingly expensive paywall, but open to the faithful for prayer this one day of the year. 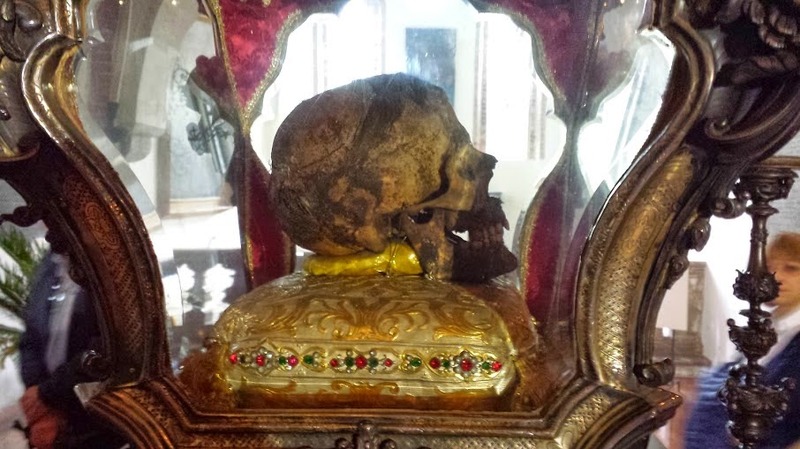 As the procession entered, the skull of Peter of Verona was displayed in a marvelous reliquary. 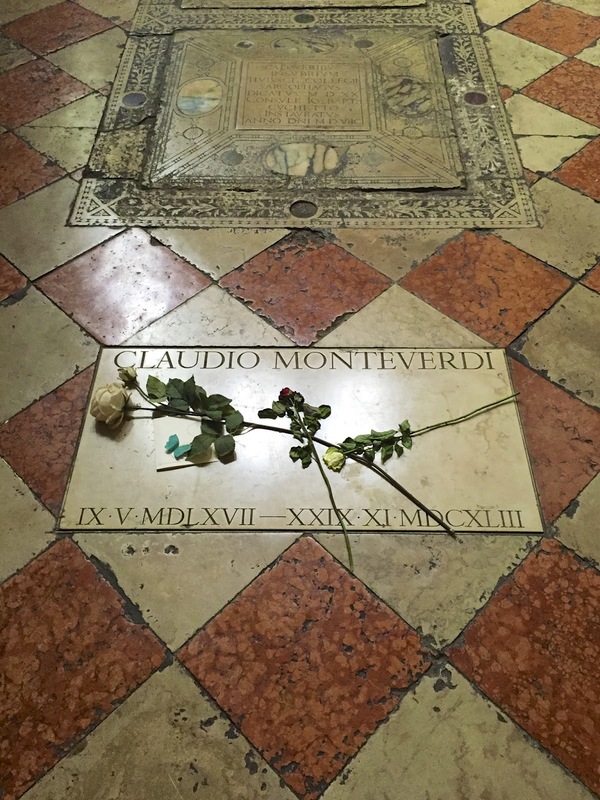 Discovered to be incorrupt at the translation of his relics in 1253, and again in 1340, his head was removed for the veneration of the faithful. Indeed, one can still see the beard and tonsure of the Dominican, as well as the brutal head wounds that caused his death. So many of the relics one sees in Europe are such remote and sometimes unknown figures it is difficult to associate their bones with their stories. With Peter we have powerful eyewitness accounts, and a clear record of cultic preservation, a fact that brings home the actions of that fateful Sabbato in Albis over 750 years ago and recorded in famous paintings from Fra Angelico to Titian. Once past the skull, the glorious Portinari chapel was completely opened, a masterpiece of Christian architecture, with perfect renaissance proportions and frescoes painted by Vincenzo Foppa. 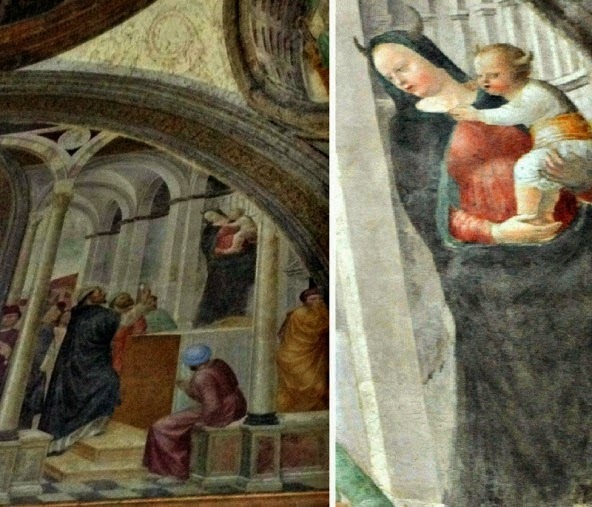 (One of the more interesting is the rare image of a Virgin Mary with devil horns, an apparition sent by the devil, which Peter dispels by showing it the Blessed Sacrament). 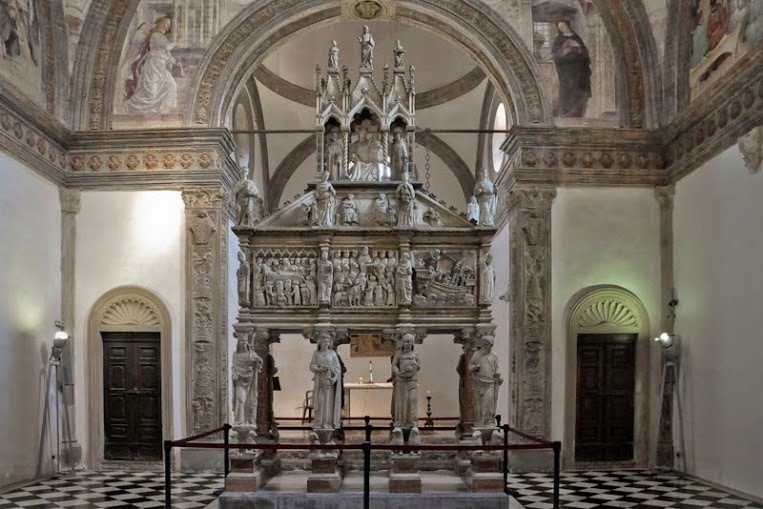 But the crowning glory is Giovanni da Balduccio’s glorious freestanding ark tomb, raised aloft by female statues representing the Cardinal and Theological virtues (with Obedience added, to make a total of eight). Around the ark are masterful bas reliefs of Peter’s life, interspersed with the Doctors of the Church, and all surmounted by Mary and Jesus, who are flank by Peter and Dominic. 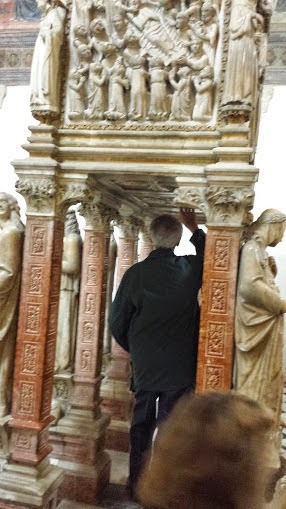 The high point was that for this one day, the Saint’s ark was returned to its original purpose: people could freely pass right through the master work, underneath the tomb, and press their heads and hands to it, just as was done in the Middle Ages. After that, deacons were present all day to present a relic of Peter for veneration, including a prayer against headaches very popular with the Milanese. (Peter’s patronage against headaches should be evident from his iconography; he is usually pictured with a giant knife sticking out of his head). This ritual included a prayer composed by Blessed Ildefonse Schuster. O God, who did grant to your Blessed Priest and Martyr Peter the grace to write with his blood that Symbol of the Faith which, after he had diligently learned it as a child, and then become a Preacher of your Gospel, he preached undaunted to the people against the errors of the heretics; through his prayers grant that Your Church might preach the Faith and confirm it in good works. Through Christ our Lord. 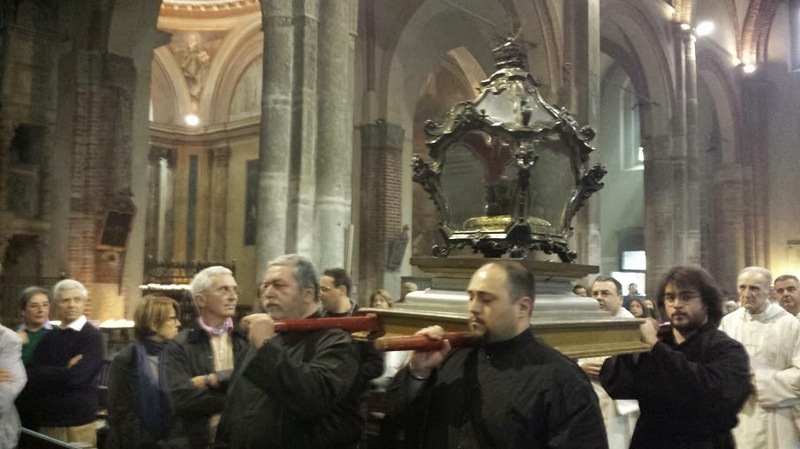 Hundreds of the faithful came through the day to venerate the head and tomb, and to kiss the relic. Such lived devotion to the Saints, so rare in majority Protestant countries, one can find alive and well in the historically Catholic areas of the world. These are the deep roots of the much maligned “cultural Catholics,” whose appreciation of the faith is often far deeper than many realize (even if greatly restricted in scope). Indeed this residual devotion is certainly a foothold in the re-evangelization of the unchurched in these areas. In the second Mass, we were privileged to see an assembly of various representatives of the Misericordia confraternities. Many ambulance services in Italy are run privately, by volunteers of the Misericordia. These were originally founded by Peter of Verona, and have been in existence for nearly 800 years, helping the sick and wounded. Another aspect of robustly Catholic culture, these fraternities were and, to a certain extent still are, religious in nature; it was Peter’s genius to see it as effective ways for the laity not only to have improved religious observance and to do good works, but to sanctify the world, and to firm up the ranks against heresy. Representatives of the Confraternities had the honor of processing in with the relic of the skull and enthroning it for Mass. After the Gospel, the priest blessed the short black penitential robes, the symbols of lay piety, bound by a rosary, and including a black mask, originally to preserve the anonymity of the members, who also and promise to take no pay save for a glass of water. Peter knew that doctrine and works go together, and that Mercy has been at the heart of the Church’s mission from the very beginning. The postulants, dressed in their colorful emergency attire, then made their promises to observe the constitutions, and then were helped to vest by their sponsors. Mass concluded with a solemn blessing in the name of St. Peter, and then the faithful came up for a chance to venerate the skull relic, guided by the new members of the confraternity. The living veneration of the saints is one of the oldest manifestations of orthodox Christianity in the world, dating from the first years of the Church. It is something we hold in common with our Eastern brothers, a genuinely traditional ecumenical principle. The Saints are like divine strikes of lightning, creations of grace scattered throughout every region and time of the Church, models of the holiness and of the possibilities of graced human nature. The revival and cultivation of their cults, pilgrimages, veneration, and prayers for their intercession, must be a vital part of any genuine renewal. Opus Sectile work in the Holy Land - Does anyone have any information about these patterns? 5. Remnants of these tiles have been found on the Temple Mount, so there was evidently another chapel with this same floor built by the Crusaders on the Temple Mount during the 12th century. On Wednesday, May 6th, at 7:30 pm, a Votive Mass on behalf of persecuted Christians will be celebrated at St. Ann's Parish, 271 Hampton Street, Winnipeg. This is a good opportunity to suggest to NLM readers that it would be highly appropriate, in these times of violent persecution, to consider offering or organizing the celebration of the Missa votiva pro Ecclesiae defensione (In Defense of the Church) with the Commemoration Pro Ecclesiae libertate on behalf of persecuted Christians, which may be used on 4th class ferial days. Sacred Scripture says: “In much wisdom is much vexation, and he who increases knowledge increases sorrow” (Ecclesiastes 1:18). The more a devout Catholic studies the history, theology, and spirituality of the Roman liturgy, the more he or she tends to become deeply discontented with the current state of affairs; and if this student has been fortunate enough to discover in a personal way the traditional Latin Mass, Divine Office, sacramental rites, blessings, processions, and so forth, sharp melancholy and intense indignation are bound to ensue. How could it be otherwise? One comes to see the vast, rich treasures that were squandered; one comes to see the shallow, brittle academic novelties that were set up in their place. One sees how it is a replay of Esau trading his birthright for a mess of pottage (or a pot of message), except that this time, it was, grievously, Jacob who did the trading. The Novus Ordo becomes, in a sense, largely spoiled for those who, making an earnest inquiry into the history of the Roman Rite, acquire a keen awareness of the imaginative archaeologisms and audacious innovations introduced by the Consilium in the 1960s and 1970s. For example, knowing how and why the new “preparation of the gifts” was put together and the old Offertory abolished makes it all the more distracting, even distressing, to hear in person those quasi-Jewish prayers of blessing, which are a total and complete fabrication and aberration in the Roman Rite (or really, in any classical rite). Or knowing how and why the venerable Roman Canon, most ancient of anaphoras, was criticized, nearly cancelled out, and, although retained, eventually marginalized by other manufactured anaphoras that have zero place in the Roman liturgical tradition is enough to make one shudder every time the shorty-sporty Eucharistic Prayer II is selected. It is not easy to go back through those church doors, time after time, fully aware of the spectacle of rupture and discontinuity playing out before one’s eyes and ears in so many texts and gestures — or more often, in so many screaming absences of text and gesture. 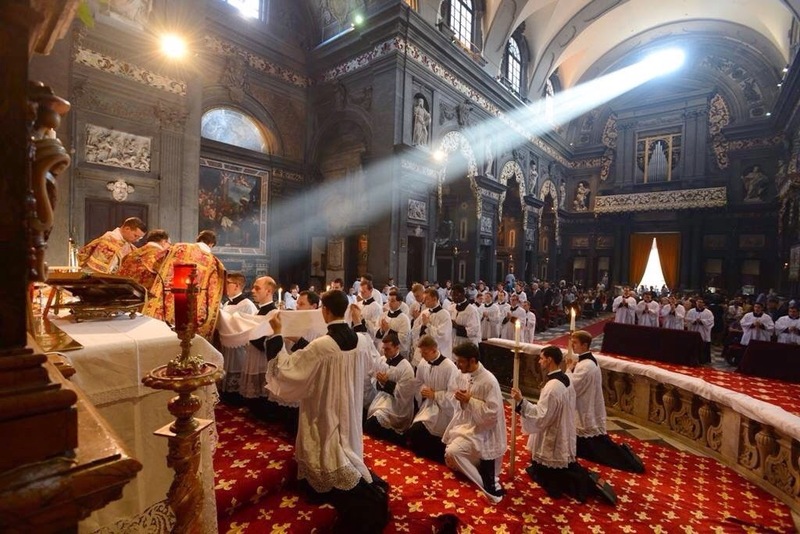 How easy, how fruitful, how consoling it would be if one could simply attend the traditional Latin Mass, and peacefully drink in its secrets, its wealth of prayer, its its pure and holy adoration. Yet we are still very far from a situation in which it is possible for most Catholics to attend the TLM on a regular basis. In fortunate cases, I can find “pegs” in the new liturgy to hang on to, which enable me to yield myself to the liturgical action without too much critical reflection. If, for example, Mass is celebrated in such a way that the preparation of the gifts is done silently while the Offertory antiphon is being sung, I am able to forget about the quasi-Jewish blessing, since my attention is being drawn to the chant, which is truly an element of continuity. 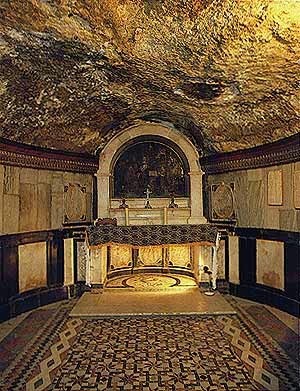 Cloaked in this way, the silent Offertory almost looks like the real thing; there is, one might say, a welcome illusion of continuity with the Roman tradition. 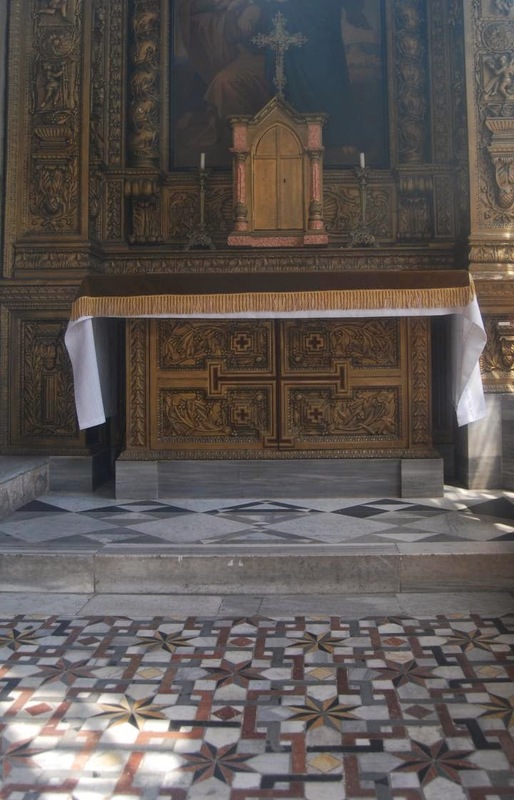 In general, if Gregorian chants are sung, if there are times of silence, if people kneel for communion, and, above all, if the priest is facing ad orientem, any or all of the above becomes a very substantial help to me in maintaining an interior calm and a focus on the Lord. One ceases to be the theater critic and becomes the simple believer. But when these traditional elements are mostly or altogether absent (as they too often are), what hits me in the face is the massive fact of discontinuity, together with my knowledge of the dubious and, at times, modernist reasons for that discontinuity. One is hit, as it were, with a left hook and a right hook — an immediate, aesthetic, intuitive reaction, and an intellectual, spiritual, reflective reaction, both negative. And that makes the time at church poorly spent: one can become frustrated and annoyed, and feel that one does not have the right dispositions for receiving Holy Communion. Is it not true for a large number of the faithful — larger than officialdom would ever admit — that the Ordinary Form as typically celebrated puts a serious, almost fatal cap on our genuine “active participation”? Far from helping us along on the road to perfection, attracting us with its inner mystery and outward beauty, such a Mass is an event we just try to get through as quickly and painlessly as possible, hoping we will not think too much about anything we are seeing or hearing. How ironic, that a rite so drastically overhauled and reworked with a view to “reaching the people at last” and soliciting their hearty involvement has, in reality, turned off and distanced so many of the faithful over the decades and made distasteful the very concept of active participation — in spite of the utterly traditional understanding and pedigree of this venerable principle. With all this spiritual trouble that my decades of studying the liturgy have brought, do I ever find myself wishing that I didn’t know the various things I now know? If I could turn back the clock to a point in time when I naïvely thought the reformed Mass was the cat’s meow, would I prefer that state of ignorance, in order to have an easier time worshiping in this impoverished zone, this region of dissimilitude? No, in all honesty, I can’t say that. My spiritual life would never have grown as it did, nor my grasp of sacred theology, had it not been for the beauty, reverence, and profundity of the traditional liturgy that I discovered as a young man, fell in love with, and now long for ceaselessly. I would not today be a Benedictine Oblate praying the Divine Office, which is a source of tremendous vitality, light, and consolation to me. My situation is far from optimal, due to the irregular availability of the traditional liturgy in my community, but I do not regret bearing the cross of knowledge, which has opened to me a whole world of wonders to which I would otherwise be blind. It is a flowering cross, and I imagine the same is true for many who love traditional ways. Sometimes people ask me why it makes such a difference whether one attends the Ordinary Form or the Extraordinary Form. Aren’t they essentially the same — the Holy Sacrifice of the Mass? Don’t you “get Jesus” at either? Usually the one asking this common question does not really grasp how great the difference is between the forms, and how much they actually form us, how much they express and shape the very content our faith. The liturgy is an ethical-aesthetic event, it’s not a supernatural slot-machine for receiving a sacrament. How we worship is itself a definite exercise of faith, hope, and charity, one that prepares us well or ill for union with the object of these virtues. 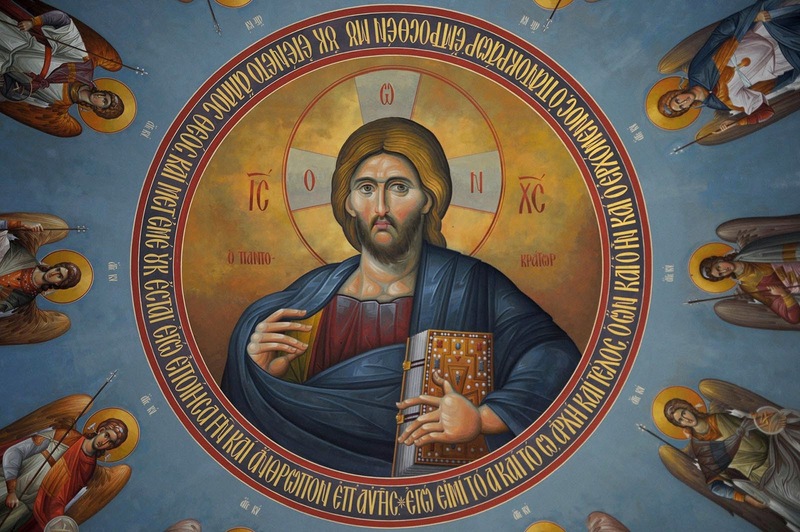 Liturgy is a certain icon of Christ and, in a way, an icon of man approaching Christ. Our very self-understanding and our orientation to God, our assimilation of His mysteries, is determined by the rite. One reaches the mystery through the liturgy; the mystery is proportioned to the mind and heart by the texts, actions, music, silence. In a sense, the mystery is given shape by the liturgy, even as it gives shape to the worshiper. Hence, pace the egalitarian conservatives, it is not as simple as “overlooking” the human instruments to allow the divine agent to work; that would be like saying one could overlook one’s wife because she is, after all, a secondary cause, while God is the real primary cause. No child will be conceived that way, nor any marriage problem solved! It is far more like the relationship between the meaning of a play, the words of it, and the way the words are presented — or even better, between a piece of music and its performance. The music has its real existence in the performance, and one accesses it through the performance. In an odd way, the music has no real existence apart from the performance, and neither has the liturgy some objective or generic essence by which we are perfected, in abstraction from the subjective and specific experience of liturgy here and now, in this or that form. We are perfected by the thing as it actually exists and functions, not by its technical validity or licitness. Attending the Ordinary Form is, in most cases, like listening to amateurs acting out a Shakespeare play bowdlerized by Victorians, or listening to a string quartet badly out of tune and time. The reduction of liturgy to validity and licitness is truly one of the most subtle and pernicious reductionisms of the modern age, since it has long prevented urgently necessary conversations about the mystical-ascetical ascent to God through the contemplative dimension of the liturgy, with its companion goods of fidelity to tradition and cultural excellence. This is the conversation that we must have, precisely for the sake of encountering the real Christ, the just and merciful Pantokrator, and for the preaching of Him to our contemporaries. I certainly don’t deny that similarly dark business took place in the 1948-1955 revision of Holy Week, as documented in a number of places, such as Don Stefano Carusi’s extensive essay. Nevertheless, even this revision cannot compare with what was done across the board to the entire order of Mass, lections, calendar, liturgy of the hours, Rituale, Pontificale, etc. in the 1960s. Eucharistic Prayer II is an example of both “the exaggerated and senseless antiquarianism” and the “search for novelty” condemned by Pope Pius XII in Mediator Dei (8; 59-64): cobbled together from bits of Hippolytus thought (mistakenly, as it turns out) to be an early Christian anaphora, given a last desperate edit at a Roman restaurant the night before its due date, and nevertheless so inadequate in conveying the theology of the Mass as a true and proper sacrifice that its content was found perfectly unobjectionable by Protestant consultants. The learned and judicious Fr. Hunwicke has written more than once on the groundless innovation of multiple anaphoras in the Roman Rite. As Mosebach would put it: see my article “Mosebach's Paradox." On the correct understanding of "active participation," see, inter alia, "A Note on Participation: What Can We Learn from the Word Actuosa?" and "Is Lack of Solemnity a Cause or a Symptom of Our Problems?" In part one, he considers the absence of a formal invocation of the Holy Spirit in the Roman Canon, and its prominence in the Eastern rites. The difference between the Eastern Rites and the Roman, in regard to the Epiclesis, depends on how the canon or anaphora petitions the Father to consecrate bread as the Body of Christ. “(T)he East says Send the Spirit so that He may change bread into Christ’s Body, while Rome says Accept our Offering so that it may become Christ’s Body.” In the third article, he explains, on the basis of Christine Mohrmann’s work on the origins of Christian Latin, why the Roman Rite chooses to make this petition with a certain kind of language, terse and legal, and very different from the florid (and more Scriptural) Eastern approach. He then argues forcibly, (and, for what it’s worth, I think these words should be held for all time as a charter for any future efforts to meddle with the Eucharistic prayers), that neither the East or West should have its Rites altered on the basis of the other’s tradition. It is not my purpose to discuss which of these attitudes is preferable, … What I do wish to highlight is, quite simply, that they are different. … One of the very few things I object to very strongly about Orthodoxy is that it sanctions ‘Western Rites’ in which an Oriental Epiclesis has been violently shoved into the Roman Canon. I would complain with no less vigour if some daft Latinising imperialist tried to mangle or eviscerate an Eastern Anaphora. Each of our rites has its own integrity, its own logic, its own grammar. Neither should be bullied into conformity with the other. To do so ... I would go so far as to call it sacrilege. This inevitably leads to the question, addressed in the fourth article, of whether the addition of new Eucharistic prayers (or ‘anaphoras’, if you prefer) makes the Novus Ordo a different Rite from the classic Roman Rite, which never had any Canon other than that found in the ancient Roman sacramentaries and the Missal of St Pius V. He begins by pointing out that various scholars, not all of them conservatives, have held the position that they are essentially different rites. a cause worth taking seriously, to restore the Roman Rite to use by using exclusively the Roman Canon. The GIRM itself has pointed to this by saying, in each edition it has been through, that “This Prayer may be always used” (Editio tertia para 365. ‘semper adhiberi potest’); a comment it makes about none of the other anaphoras. 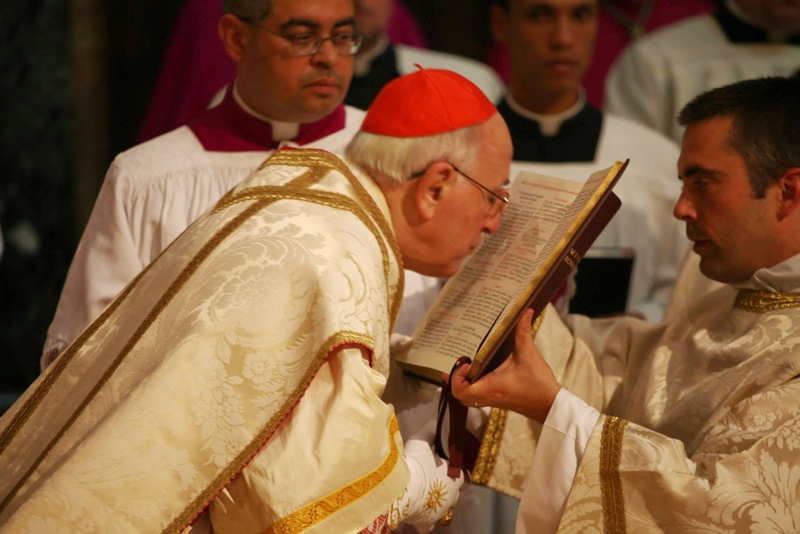 He is also very careful to state, in clear and very red letters at the end of the fourth article, that the status of the Novus Ordo as a different Rite does not make it any way invalid. The ecumenical implications of this question should not be lost on anybody, for if a formal Epiclesis is indeed essential to the Eucharistic Consecration, the unavoidable conclusion is that the Roman Rite has always been invalid. 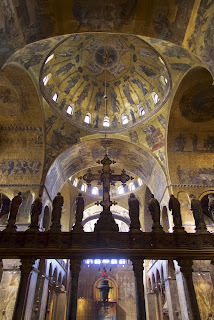 It is true that ‘the Great Church of Constantinople’, replying in 1896 to overtures of unity from Leo XIII, alleged that “The One, Holy, Catholic, and Apostolic Church of the Seven Ecumenical Councils used to receive [the teaching that] the precious gifts are hallowed after the Epiclesis of the Holy Spirit by the blessing of the priest”, apparently thereby implying that the Church and Rite of Rome did not exist in the centuries between Nicaea I and Nicaea II in 787. But this only proves that we Latins are not the only ones who quite often say and do extremely foolish things. Happily, a few years ago a writer in the theological journal of the Moscow Patriarchate declared himself content with the Roman Canon. It is a shame that the dominant school among the fashionable intellectuals of the Western Church in the 1960s did not share this contentedness. The sixth part concludes the series with a beautiful consideration of the Sacrifice of the Mass, and how the Eastern tradition can help us to understand It as an offering made once, and yet continually made anew. (God) created a multiplicity of times and a multiplicity of places. Within those multiplicities, He could have created just one, monic, being to exist and to be loved; but He chose instead to create a multiplicity of beings. And so it is into that complexity of times, places, beings, that His ‘Once for all’ is graciously communicated. The sacrifice of the Eternal Son is, in the Mass, made ‘sacramentally’ present on earth, in and to that plurality of the times and places which the Creator God in his fluent generosity has given to the innumerable multitudes He has created in which to worship him and to work out their salvation. And whenever it is so made present, Christ our God does “go forth to be slain in sacrifice”. 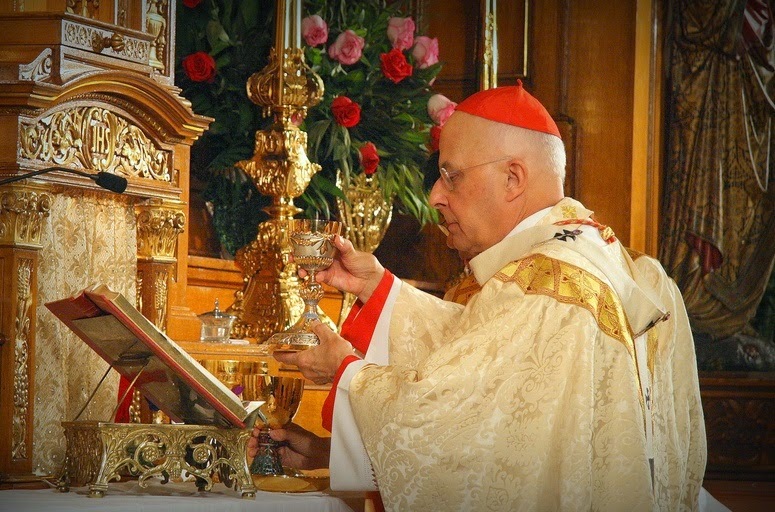 (citing the Liturgy of St James) Furthermore, each Eucharist, bestowed from Eternity into Time, is not merely the offering of a monic being, but of Christ in his social body the Church, associating with him and in him those who are partaking in that new Mass in that new moment, so that the sacrifice of the Mass is ever one and unchanging and rooted in Eternity, and yet for ever here and for ever new. So I’ve never had any problems with that offertory prayer in the Sarum Mass, in which the priest referred to hoc sacrificium novum. But, of course, the ‘Reformers’ did object, and the idea of a nova mactatio (new slaying) has come to be regarded as one of the worst corruptions of medieval Catholicism. It is good to have the Rite of S James to remind us that this way of employing language is not only sound and wholesome but is guaranteed by the witness of East as well as of West. Some more from the show of reliquaries and other liturgical objects currently going on at St Peter’s Basilica in the Vatican. Three 15th-century processional crosses in silver and copper, partially gilded. Reliquary bust of Saint Lituardo, patron Saint of the city of Tarquinia, mid 15th-century. From the Tarquinia diocese Museum of Sacred Art. Sacra Liturgia USA 2015 will open in New York on Monday, June 1st, at 4:00pm at the Kaye Playhouse at Hunter College. We are honored that His Eminence the Archbishop of New York, Timothy Michael Cardinal Dolan, will be present and will offer an address of welcome to the participants. His Excellency, Bishop Frank J. Caggiano, Bishop of Bridgeport and a native of Brooklyn, will speak on the role of the renewal of the Sacred Liturgy in the life of the Church today. Dom Alcuin Reid, who coordinates the Sacra Liturgia initiatives on behalf of Bishop Dominique Rey, Bishop of Fréjus-Toulon, France, will convey a message from Bishop Rey (who is himself unable to be in New York due to a meeting of the French bishops). The conference’s USA organizers Father Richard Cipolla and Dr. Jennifer Donelson will then speak on the rationale for Sacra Liturgia USA and on conference logistics. 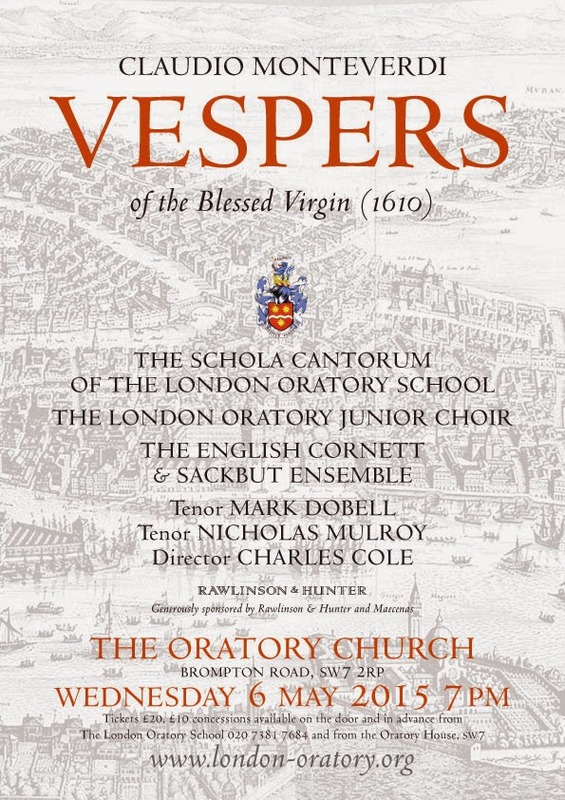 vespers, to be celebrated at the Church of St. Catherine of Siena (East 68th St.) at 7.30pm. The conference is open to all who are interested in the Sacred Liturgy. Full and part time registration details are available at http://sacraliturgiausa.org/conference/. The registration deadline is May 1. 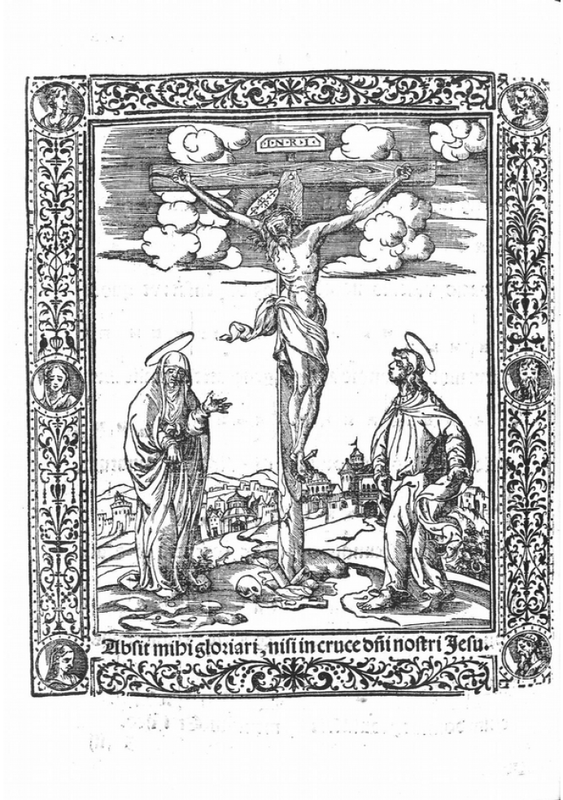 In the course of researching my articles on the Theology of the Offertory, and specifically the offertories of the medieval Spanish uses of the Roman Rite, I came across an interesting custom in the way of printing certain Missals before the Tridentine Reform. I believe this custom may be completely unique to Spain; I have never seen anything like it in any of the great many other medieval Missals I have read through over the years. (I here use the term “medieval” in reference to the origin of these liturgical customs; the Missals themselves were printed in the Renaissance.) 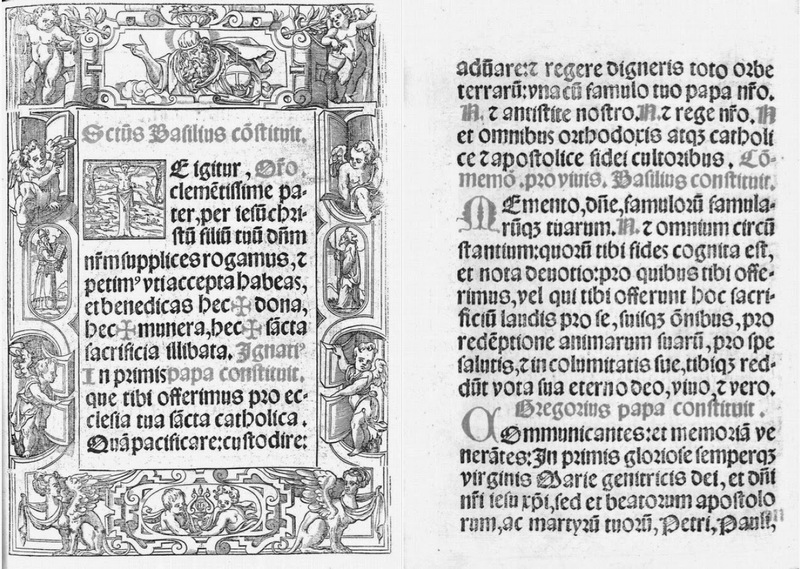 The examples I give here are from the Missal according to the Use of Seville, printed in that city in 1565, and that of Segovia printed at Venice in 1500. 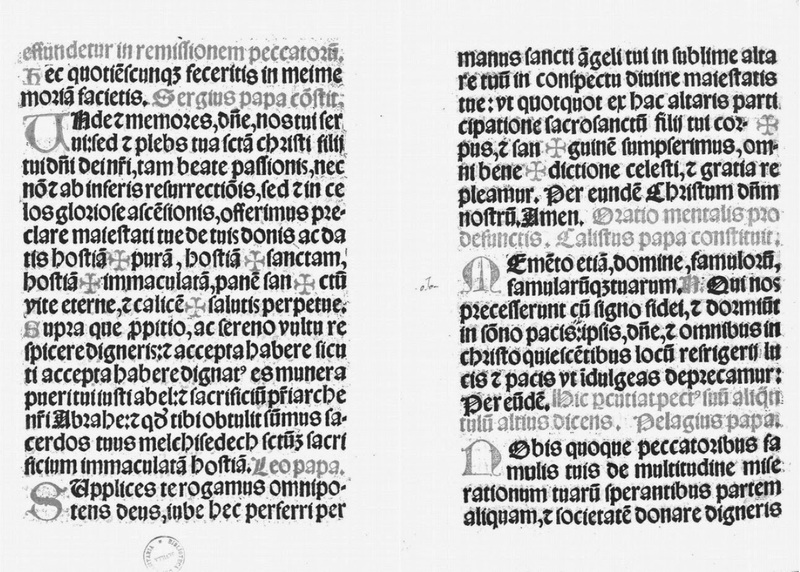 In these missals, each part of the Canon of the Mass is labelled with its putative author, each of whom “constitutit – established” that that part of it be said. Where these attributions come from, I cannot imagine, and their inventor had some rather confused ideas about Church history. Except for St Basil, all of the supposed authors are called “Papa”, but there has never been a Pope named Ignatius, Maxentius, or Bricius. (This last is traditionally Anglicized as “Brice” when it refers to St Martin of Tours’ disciple and successor.) Of course, the word “Papa” was formerly used for other bishops beside the Pope, and it likely that “Pope Ignatius” means St Ignatius of Antioch. “Pope Maxentius” remains quite mysterious. 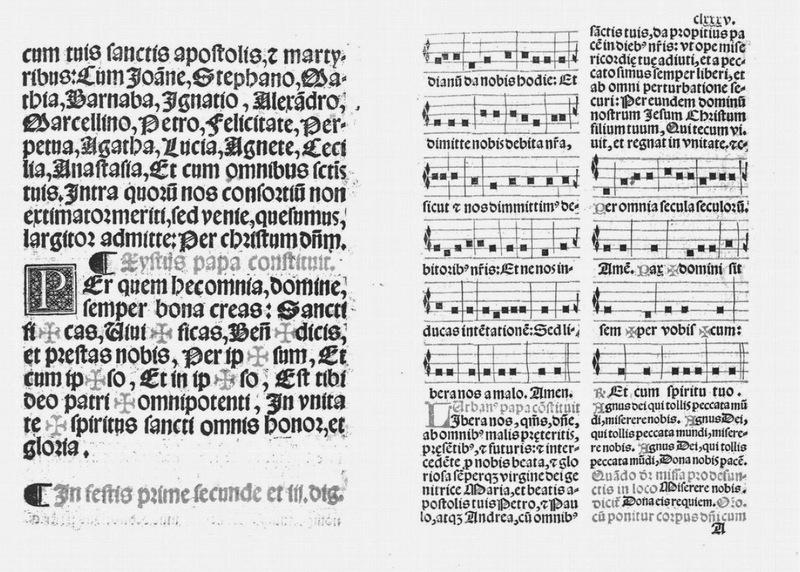 The Missal of Seville gives three different tones for the singing of the Our Father, but says nothing about its author, presumably understood to be the Lord. The Missal of Segovia, on the other hand, puts before it the words “Gregorius dialogus constituit – Gregory the Dialogist established”, i.e., that it be sung after the Canon. (“Dialogus” is the title by which Pope Gregory the Great is known in the East, referring to his collection of Saints’ biographies, the Dialogues.) Both Missals agree in attributing the Libera nos to Pope St Urban I, 222-230. Despite the historical confusion, and the fact that none of these attributions rests on any evidence, several of the Saints named herein are traditionally known as the authors of various parts of the liturgy, or the originators of certain liturgical customs. The anaphora attributed to St Basil the Great is used in the Byzantine Rite on a handful of days, including the Sundays of Lent (but not Palm Sunday), Holy Thursday and Holy Saturday. St Ignatius of Antioch is traditionally said to have instituted antiphonal singing in church, after a vision of angels chanting thus in Heaven. 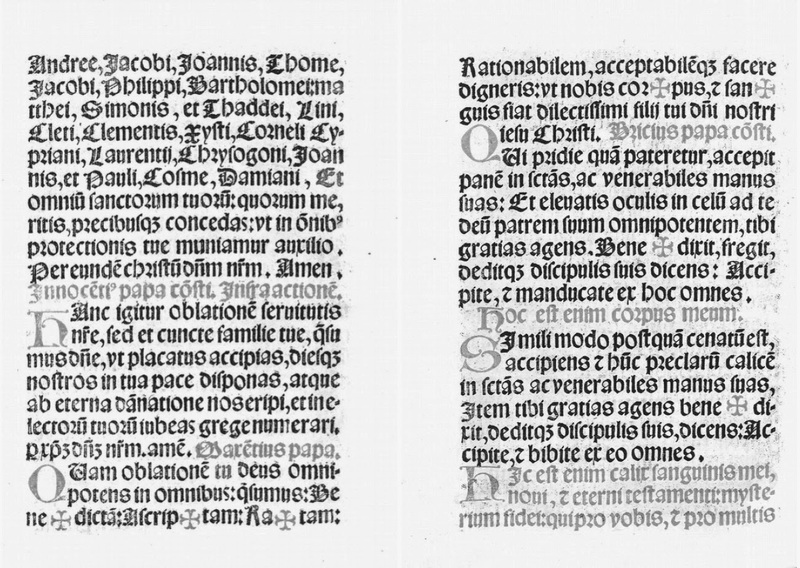 Among Gregory the Great’s many contributions to the liturgy is the addition to the Canon of the words “diesque nostros … grege numerari”; he also did move the Lord’s Prayer to its place after the Canon. The Byzantine Rite attributes to him the Liturgy of the Presanctified Gifts which is celebrated on certain weekdays of Lent, and commemorates him at the end of that service. Sergius I added the Agnus Dei to the Mass, and Leo the Great added the words “sanctum sacrificium, immaculatam hostiam” to the Canon. Calixtus I is said to have instituted, or rather formalized, the Ember Days, which Leo (two centuries later) believed to date from Apostolic times. The March lecture of the Catholic Artists Society was given by Bishop James D. Conley of Lincoln, Nebraska. The bishop made an eloquent and stirring case for giving attention to aesthetic matters in the pastoral concern for souls and the life of the Church. There exists a close connection and communication between Sacred Tradition and Sacred Scripture. For both of them, flowing from the same divine wellspring, in a certain way merge into a unity and tend toward the same end. For Sacred Scripture is the word of God inasmuch as it is consigned to writing under the inspiration of the divine Spirit, while Sacred Tradition takes the word of God entrusted by Christ the Lord and the Holy Spirit to the Apostles, and hands it on to their successors in its full purity, so that led by the light of the Spirit of truth, they may in proclaiming it preserve this word of God faithfully, explain it, and make it more widely known. Consequently, it is not from Sacred Scripture alone that the Church draws her certainty about everything which has been revealed. Therefore both Sacred Tradition and Sacred Scripture are to be accepted and venerated with the same sense of loyalty and reverence. Sacred Tradition and Sacred Scripture form one sacred deposit of the word of God, committed to the Church. Dom Mark Kirby, Prior of Our Lady of the Cenacle Monastery in Ireland, speaks of “the age-old law that grounds and shapes both Catholic doctrine and the Catholic moral life: Lex orandi, lex credendi, lex vivendi.” This is a pithy way of saying that “the law of praying” (how we pray) shapes “the law of believing” (what we believe), which in turn informs “the law of living” (how we actually lead our lives). The lex orandi is the enactment of the sacred liturgy; it is composed not only of texts, but also of the whole complexus of sacred signs, gestures, and rites by which, through the mediating priesthood of Jesus Christ, men are sanctified and God is glorified. The sacred liturgy itself—being the Holy Sacrifice of the Mass, the other sacraments, the Divine Office, and the various rites and sacramentals found in the Church’s official liturgical books—is the Church’s theologia prima. ... The Church’s primary theology is not something invented by learned men; it is found in the givenness of the liturgy, the primary organ of the Church’s authentic tradition. It is in the celebration of the liturgy’s mysteries, and in all of the new, mystical, and communal life flowing from it, that the Church maintains in unity the perpetual and perpetually living consciousness of the immutable deposit of faith entrusted to her. The liturgy is the primary font or source of our knowledge of revelation. … [I]t is the ordinary, normal context wherein Christian worshipers encounter the divine realities in such a way as to participate in them contemplatively and prayerfully. 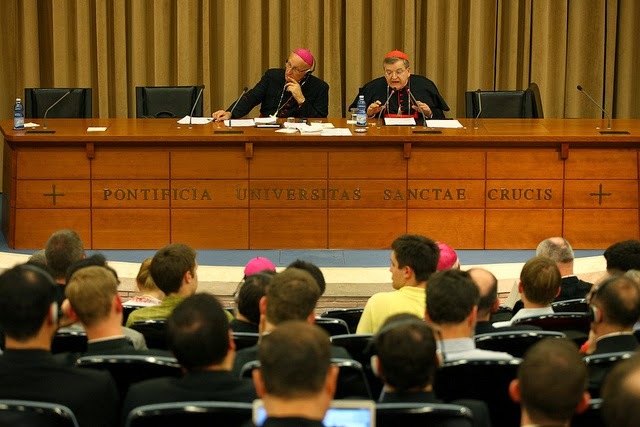 Encyclicals and councils serve the primarily didactic purpose of informing the intellect of the individual truths of faith—a necessary thing in the Christian life. But the liturgy does this and more. The liturgy is where this formation of the intellect bears its fruit in the living out of faith. The liturgy is faith in practice. It is where Christians receive revelation, believe in it, and act upon that belief by directly worshiping their Creator. … The liturgy, too, is a medium through which revelation is communicated. Indeed, as stated before, it is the definitive and primary context wherein this communication and reception of revelation occurs for Christians, precisely because it is the central act of Christian worship. Worship is the principal act of religion; all other acts are vain unless directed to the act of worship. Nothing is to be changed unless it is a case of indispensable necessity. This rule is most wise, for the Liturgy is truly a sacred testament and monument—not so much written but living—of Tradition, to be reckoned with as a locus of theology and a most pure font of piety and of the Christian spirit. Here, too, we can start to see connections between what I argued concerning the Book of Revelation (the cosmic centrality of worship and the heavenly liturgy of the Church Triumphant as paradigmatic for the Church Militant on earth) and what one learns from Romano Guardini’s Sacred Signs on the language of symbols, through which we come to understand and relate with God, and by which we express what is most inward and most exalted in ourselves. Before all else … the primary antecedent is humility before the source itself. Already the ascetic principle of faith is operative, understanding that the liturgical traditio is not “some old piece of cloth,” to use a famous phrase of Cardinal Ottaviani, open to free flight or arbitrary incisions and repiecing. The texts, gestures, signs, symbols, music, the full panoply of the liturgical culture, all have together an internal cohesion, sense, depth, and character. The thing itself deserves reverence because it is holy and the principal font of revelation. The lex credendi is the articulation of what is already given, contemplated, and celebrated in the lex orandi. The Church’s doctrine emerges in all its shining purity—in the veritatis splendor—from the wellspring of her liturgy. Catholic doctrine, the Church’s theologia secunda, is the fruit of her liturgical experience. … The lex vivendi is the Catholic moral life, a life quickened by the theological virtues, a life in obedience to the divine commandments, characterized by the cardinal virtues, illumined by the Beatitudes, enriched by the Seven Gifts of the Holy Spirit, and displayed in the Holy Spirit’s Twelve Fruits. 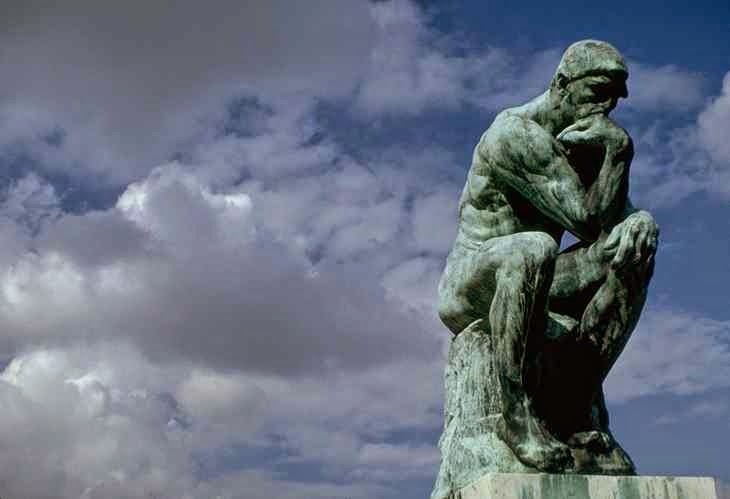 The lex vivendi pertains to all that teaches men to live rightly, to every ethical and social question, and to the pursuit of that holiness that already we contemplate in the saints set before us by the Church. The restoration of Catholic doctrine in all its beauty and richness, and the consequent reclaiming of Catholic discipline as something both healing and life-giving, will begin with the restoration of the sacred liturgy. Liturgy does not merely teach belief and transmit grace. It revives and renews the sacred mysteries of Christ in time for the faithful. In doing so, one encounters Christ, the angels and saints, and glimpses the greater spiritual reality of the Lord while remaining on earth, blurring the lines which separate the eternal and the temporal. One leaves the liturgy and the “mystical supper” of Christ not only having learned what to believe, but also how to believe when he returns to the world outside the temple. … How does one orient one’s self to God and away from sin? How does one see the world and God as He wishes? The liturgy shows us this, in conjunction with being the setting for the Sacraments, wherein the Holy Spirit acts and makes the work of Christ immediately accessible to the believer. … The purpose of the liturgy, especially during the great periods of the year, is to unite the faithful to God so that they might know Him and save their souls. He gathers them to Himself and to His new Jerusalem, the Church, and to His Body, again, the Church. All the quotations of Dom Mark are from his article “Liturgy, Doctrine, and Discipline: The Right Order." See also Joyce Little's article "Lex Orandi, Lex Credendi: Many Young Catholics Find Liturgy Incomprehensible and Irrelevant. Is It?" Cited in George Cardinal Pell's "The Translation of Liturgical Texts" (and by many other authors). The Maestro, "Liturgy, Revelation, and Tradition." Cited in Paweł Milcarek's excellent article “Balance Instead of Harmony." Dom Daniel Augustine Oppenheimer, "Asceticism and Tradition." The Rad Trad, "Liturgy & Tradition: Sensus Fidelium." Thanks to the generosity of donors, we've been able to provide almost 20 full-tuition scholarships to seminarians and religious. Thank you!! If you'd like to make a donation to students, seminarians, and religious still on our waiting list, click here. The Basilica of St Peter is hosting an especially interesting show of sacred sculptures in gold, silver and bronze, from now until June 30; the objects displayed include reliquaries of various kinds, as well as chalices, pax bredes and processional crosses, from several different periods. As I was visiting the show yesterday, I had the good fortune to overhear one of the curators, Dr Benedetta Montevecchi, talking about some of the items to her colleagues, and I had to interrupt her briefly to express my appreciation of her work, which is accompanied by a some very useful didactic material. She explained to me that most of the objects have been brought to Rome from small towns in the province of Lazio which are rarely if ever visited by tourists; the show provides a unique opportunity to see a good number of very beautiful pieces which otherwise could only be seen with a fair amount of travel and the good will of friendly clerics and sacristans. In particular, many of the reliquaries are only brought out on the patronal feast days of these small towns. To protect these precious works from thievery and grubby fingers, they are almost all displayed in glass cases, the constant bane of rank amateurs with cameras like myself, but a fair number of these came out reasonably well. (In many of them, you can the reflections of objects from other parts of the show.) I will post more photos in further posts next week. If you are in Rome anytime until June 30, you can visit the show yourself in the Braccio Carlo Magno, on the left side of St Peter’s Square; it is definitely well worth your time. Silver reliquary of St Ambrose, Roman soldier and martyr, Patron of the city of Ferentino; made by Fantino Taglietti in 1641. From the co-cathedral of Ss John and Paul. The Coronation of the Virgin, and Four Saints; embossed silver on wood, Lazio, end 14th-century; from the treasury museum of the Cathedral of Veroli. Reliquary of the Cross in silver (partially gilded); by Domenico Mariani, 1755; from the church of St John the Baptist in Campagnano di Roma. Reliquary statue of St Roch in silver and bronze; work of a Neapolitan silversmith, 18th-century; from the church of Santa Maria Assunta in Cisterna di Latina. Above it can be seen the reflection of a video of a religious procession, in which a reliquary is being carried on a float.